Antonio Vivaldi; George Frederick Handel. Very Good. In very good packaging. 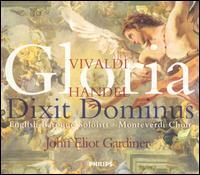 John Eliot Gardiner-Vivaldi: Gloria / Handel: Dixit Dominus by John Eliot Gardiner. Antonio Vivaldi; George Frederick Handel. New.